Yep! Today is the Fourth Annual #QuadDay! Basically, this is a day set aside to drink a Belgian (or Belgian-style) Quad and tell your friends about it. The End. Here's a link to last year's beer which will further link you back to years past, if you care. 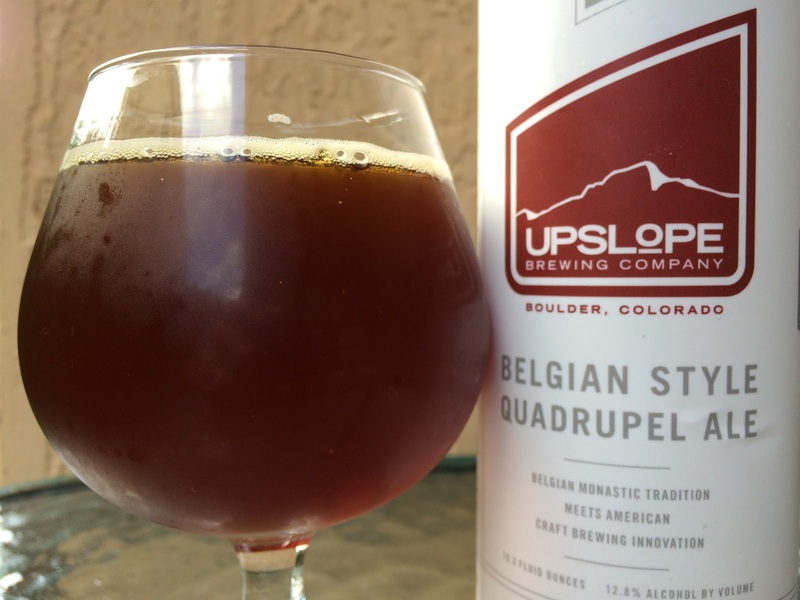 Today I'm drinking Lee Hill Series Vol 5: Belgian Style Quadrupel Ale brewed by Upslope Brewing in Boulder, Colorado. 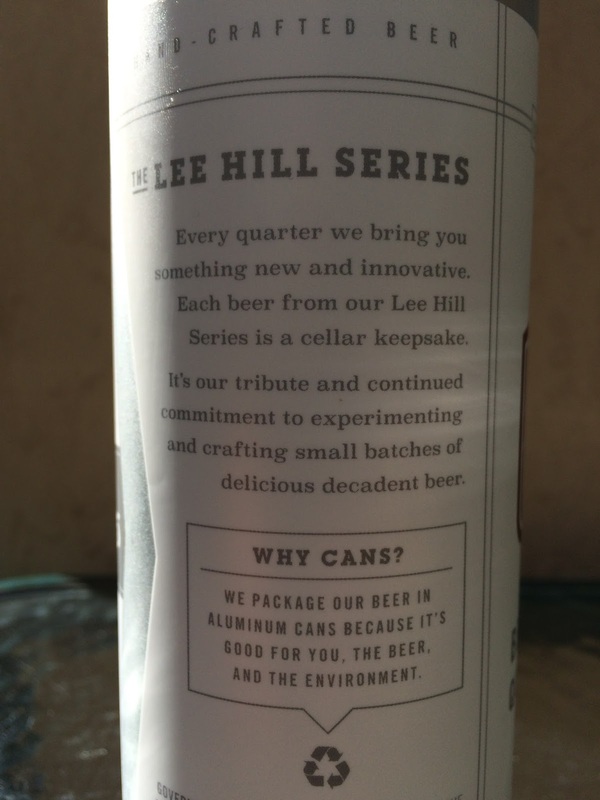 Again, the Lee Hill Series is a quarterly small batch experimental brew worthy of cellaring. I refrigerated my 19.2 oz can since I received it; however, its canning date 7/29/15 shows it hasn't had any real opportunity to mature. 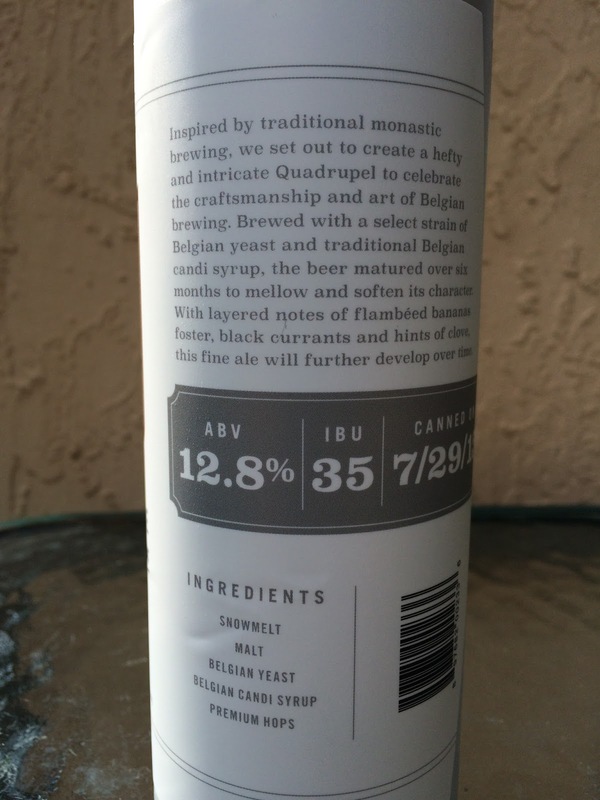 There is a story on the label sets your expectations of this big beer: 12.8% alcohol. 35 IBU. "Belgian Monastic Tradition Meets American Craft Brewing Innovation"
Big aroma of candied orange rind, huge bananas and yeast followed by lots of nuances. Basically this smells like the sweets at the state fair: funnel cakes, cotton candy, etc. Sweet candi sugar flavors come first but are followed immediately by loads of bananas, then orange, then raisins, then cherries. Fruitalicious! Very creamy, nice carbonation, and a definite Belgian yeast character throughout! Now, I would be lying if I didn't tell you that an alcohol mention should have made every paragraph in this review. While it is very noticeable and boozy and even shows hints of some weird medicine in the background, overall I find it an enhancer of the bananas and some spicy flavors that build as you drink. Very much on the sweet side, even a little syrupy. Sweet and alcohol were both big, and both were a little too much for me. Nice flavors and complexities, though. Check it out if you have the chance!